After a four-year hiatus, Sydney-based Pnau returned to the stage in all their blistering, high-intensity glory with a sold-out show at the Croxton Bandroom in Thornbury, Melbourne on Friday 24th March. It was ten years ago that I was first captivated by their bright, experimental sound and theatrical visuals. In many ways they (along with the Australian indie dance scene of the era, the likes of The Presets, Cut Copy, Bag Raiders and the like) were hugely foundational to my love of music. With this gig, I was keen to see how they’d grown up, as I had, 10 years later. 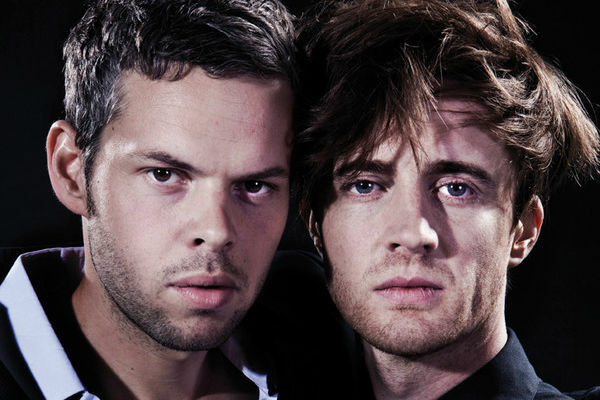 Pnau, made up of duo Nick Littlemore (vocals, production) and Peter Mayes (guitar, production), had floated among the indie dance scene since 1999, but cemented their place as Australian dance music royalty in 2007 with the album Pnau, with a slew of singles reflecting their animated, chaotic sound and threaded with bright, happy and at times ridiculous lyrics (e.g. Baby, Wild Strawberries). Collaborations with Ladyhawke (Embrace) and Luke Steele (With You Forever, Freedom) not only demonstrated their versatility and bold reinvention of alt dance, but also nurtured the subsequent successes of both Ladyhawke and (Littlemore and Steele’s) Empire of the Sun. Their approach shaped the local dance scene irrefutably and also reverberated globally with Elton John choosing to work with them on Good Morning to the Night, a remix album of his music. Late last year Pnau dropped Chameleon, a big, kaleidoscopic, addictively-catchy party single, as a teaser for their anticipated new album. Chameleon features vocals from Pnau’s heavenly new muse Shakira Marshall, (aka alter-ego Kira Divine) an artist of Guyanese descent hailing from Queens, NY. Divine’s unique choreography and style of dance known as #AfroSoca are featured in the video for Chameleon and were clearly a huge influence for Pnau – so much so that Marshall will reportedly feature on many songs on their upcoming album. On Friday, while we shifted from foot-to-foot in impatient anticipation for Pnau’s return to the stage, Melbourne-based SAATSUMA brought the pre-party vibes with their slow-burning, warpy electronic soundscapes and distorted vocals, moving through tracks like synth-heavy Floating and the trippy, vibrant pop number Isolate. When Pnau emerged, it was clear that these were different men than the ones that tumbled onto stages in the mid-2000s among caricatures of dancing strawberries, suns and birds. Littlemore, while still wirey and floppy haired, had an intensity and authority, a deliberacy in his movements that felt different and new. The show opened with a penetrating synth build and Littlemore craned over a horn, his lungs squeezing every last molecule of air out; before he belted out the ridiculous but undeniable Wild Strawberries and a landslide of completely new music, track after track of big, unapologetic, unmistakably-Pnau dance numbers. Kira Divine joined the stage shortly after; a radiant neo-tribal vision adorned with glowing, dotted skin and frenetic dance manoeuvres, and largely supplied the vocals for the evening. The new songs from the upcoming album seemingly dominated the first half of the set, and they were very good, with Divine’s voice showcased in all its glory. We didn’t know the lyrics but we followed Divine’s lead and grooved alongside a smitten audience, folding and jumping and bouncing along to a slick array of new tracks. Throughout the show Pnau weaved in some of their classic tunes like No More Violence, Forever, Baby and Come Together, with the audience’s textbook recall of the lyrics a reminder of the inimitability and timelessness of these tracks over the past 10 years. Littlemore responded to the audience’s zeal with moments of impassioned preaching, yelling gospel-like at the audience to come together and be with each other in the moment. The highlights of the evening were Chameleon (with Divine clearly in her element as she folded and arched across the stage; a picture of unimaginably glorious femininity and power) and the final song Embrace, with Divine admirably carrying Ladyhawke’s vocals and the audience clamouring for more. It was exhilarating and exhausting, both nostalgic and renewing. Reflecting back, it was a very different show to what we would’ve seen from Pnau in the past; less sunny and joyful, and more dark and intense; less tried-and-tested stage routine, and more bold experimentation. Like anything though, Pnau’s latest sound has a reassuring familiarity to it, like coming home after ten years away. A decade after doing it for the first time, Pnau seem ready to usher in another new wave of Australian indie dance music, and I for one am bloody ready for it.